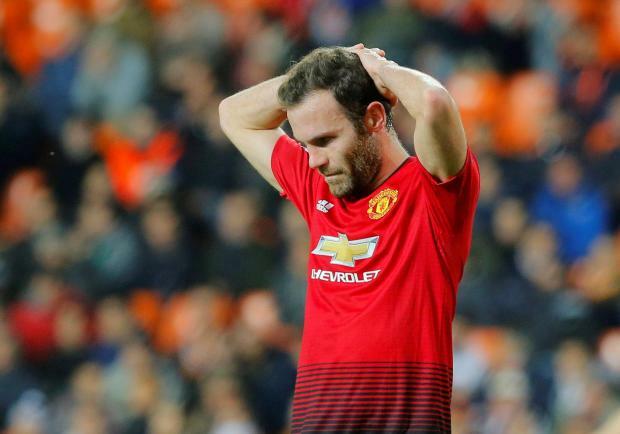 Manchester United's Juan Mata reacts to the loss which keeps them away from the group's top spot. One-half of the unlikely scenario materialised as the Swiss side beat the Italian giants 2-1 but United blew their chance with a defeat that consigned them to second place in Group H.
Carlos Soler put the La Liga side ahead in the 17th minute with a powerful finish before United defender Phil Jones scored an embarrassing own goal at the start of the second half to double Valencia's lead. With one eye on Sunday's trip to Premier League leaders and historic rivals Liverpool, Jose Mourinho rotated his side, making eight changes from Saturday's 4-1 win over Fulham, including bringing record signing Paul Pogba back into the fold. Pogba had United's best opportunity to cancel out Soler's impressive opening strike following a Marouane Fellaini knockdown but somehow missed the target from close range with the goal gaping. United's task in turning the game around became significantly harder thanks to a clumsy moment from Jones, who failed to communicate properly with team mate Sergio Romero and slid the ball into his own net.